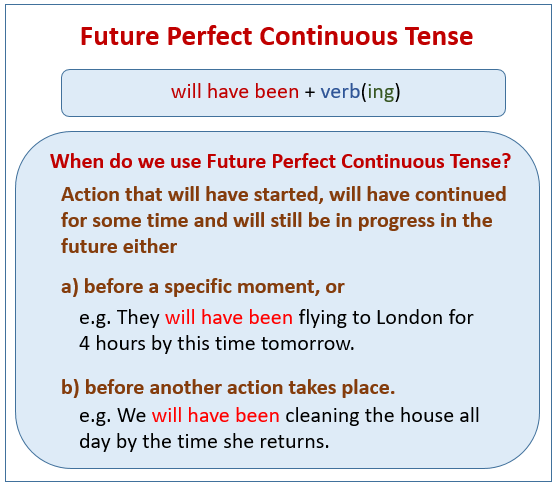 The following diagrams show examples of Future Perfect Continuous Tense. Scroll down the page for more examples and explanations. I will have been working at the hospital for two years next month. The past future continuous is similar to the future perfect, except that it expresses longer actions in the future before another action in the future. She will have been waiting for nearly an hour by the time the bus finally arrives. He will have been working at the bank for a year before it finally closes. This English tenses lesson will teach you about the last three future tenses to complete our series on learning the tenses. You will learn how and when to use the Future Continuous, Future Perfect and Future Perfect Continuous when speaking English. This video is about the Future Perfect Continuous. This is one of the hardest tenses for students English. The teacher will give you easy an easy example sentence to better understand it and provide you with formulas to make the different types of sentences. This lesson is for elementary students who wish to improve on their grammar, and even for advanced students who need to brush up on the grammar rules.